Well, they’ll certainly get that! They will get that also. Often one of the hardest things to face when dealing with a child with mental, developmental, or physical issues is the isolation many parents feel. The “Why me?” and “Where is my perfect child?” syndromes are hard enough to overcome; the feeling of “it’s only me” can be unbearable. Journey with Julian and books like them, go a long way in easing the misperception of aloneness. Autism now strikes over one percent of all children; other mental disabilities such as anxiety disorder, OCD, ADHD, eating disorders, bipolar disorder, and schizophrenia easily claim another 20 percent. And many children with the aid of their parents are dealing with more than one disorder. 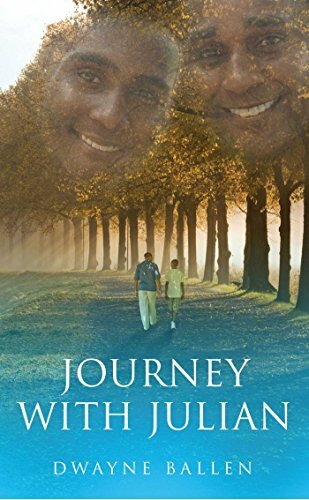 Journey with Julian, which loosely follows the Ballen family’s journey with Julian from age five to nineteen, is primarily a collection of posts from a blog by the same name that Mr. Ballen began after his older son was diagnosed with autism at the age of four. Enhanced by the addition of family photographs and Julian’s artwork, nowhere in this book does the love Mr. Ballen has for his son falter—even when Julian’s behavior is at its worst. In fact, Mr. Ballen is very careful to stress repeatedly that Julian is physically beautiful, almost always polite and pleasant, and very much loved by everyone who knows him. This is so much the case that it begs the question: Who is this book really written for? For others? For Mr. Ballen? Or for Julian? Mr. Ballen spends an entire chapter defending the fact that he’s never felt bitterness with regard to his son. Anxiety, trepidation, frustration, and concern for his future—yes. But never bitterness. Speaking of concern for his future: Mr. Ballen’s seemingly constant mention of his son’s love for Disney movies, his love of animals, and his amazing ability to draw reads almost like one long job resume. Mr. Ballen’s repeated declaration of his desire for his son to someday work as an animator for Disney would become tiresome (Disney, are you listening?) if not by the fact that by the end of the book this declaration makes perfect sense. In an ideal and just world this desire would come to fruition. Taking this journey with Julian and his father will enlighten and educate. This is not a textbook; Journey with Julian will not directly provide resources, diagnostic tools, treatment advice, or even a whole lot of personal advice. What Journey with Julian does provide is hope, conveying the importance of family, the necessity of acceptance, and the pure joy of unconditional love.